BELOIT, Wis. (February 6,2019) —PlayMonster’s Automoblox®, an award-winning line of high-quality collectible toy vehicles that innovate the classic wooden toy vehicle category, is seeing some new looks and fresh ideas! The Ultimate Series is a redesign of the large vehicle line, so it now offers more pieces for more play and creativity, as well as more distinct vehicle styles! The new sets will be revealed during North American International Toy Fair in New York, February 16 – 19 at booth #435. The Automoblox Ultimates Series features four unique sets that include 23 mix-and-match components. 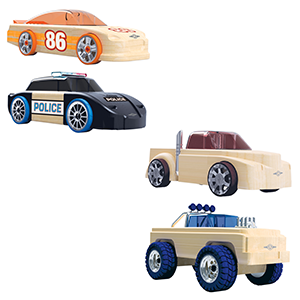 With these pieces, kids can create one vehicle at a time, and up to eight different looks! Chaser Racer includes parts to build a police cruiser, race car, and everything in-between; Mondo Brawler is all about awesome trucks; Fierce Mayhem features slick, sporty cars; and Midnight Mamba flaunts a rich black color on its super cool vehicles! If a collector has multiple Ultimates, they can be mixed and matched with one another to create even more vehicles! Vehicles sport a body made of European beech wood, and include multiple interchangeable components, including tires and wheels. With its mix-and-match creative design features, it’s easy enough for kids as young as 4 to get in on the fun, and the cool, collectible designs appeal to older kids and adults as well. No tools required! For ages 4+. Each Automoblox vehicle includes a unique VIN that can be used for online registration into the owner’s club, where fans can learn about news and cool events, so the fun never ends!